I am crazy about roses. I could spend a whole day just admiring their delicate petals, marveling at their vibrant colors, and drinking in their intoxicating scents. I inherited my passion for roses from my grandmother, who was a florist by trade and rose show judge. At an early age, she had me rolling up my sleeves to help spread manure around her rose bushes (which I wasn’t crazy about at the time!) and learning to prune and nurture each bush. Cutting roses back in the winter is always a fascinating chore for me. What I have learned is, the more ruthless you are about cutting back those beautiful canes, the more you will be rewarded with bouquets of beautiful blooms in the spring. I used to struggle with this process, excruciating over every cut. “Should I really cut that cane back so far?” “What if I cut too much and I miss out on some roses as a result?” “That’s a nice looking cane, maybe I should just leave this one a little longer?” If I stick with the pruning principles my grandmother taught me, the end result is a few stubby canes sticking out of the ground. Not much to look at! But I have learned to trust the process. I no longer see my rose bushes as ugly in this phase. I see them ready to burst with new growth and new beginnings. I’ve also learned that if I give into my fears and leave the canes too long, I’ll end up with gangly rose bushes that can’t support their new growth in the spring. Inevitably, I will spend the rest of the year staking up blossoms that are too heavy for the plant to support and regretting my momentary lack of courage. My garden is always teaching me important lessons like this. After the roses are pruned, I look around and ask myself, "what am I clinging to that really needs to just be cut back, or removed altogether?" "Am I brave enough to go dormant once in awhile to prepare myself for new growth?" "Can I handle looking unattractive for a few months in order to fill the world with beauty for the rest of the year?" If only I could borrow the courage of my rose bushes and put my stubby canes out there, so unapologetically, confident that a new season is coming. I usually feel most comfortable when I am in the position to offer beautiful flowers to my friends and family. But my rosebushes remind me that risking vulnerability is one of the best treasures we can offer our loved ones. Putting ourselves out there gives our loved ones permission to take risks too, with less fear of judgement. 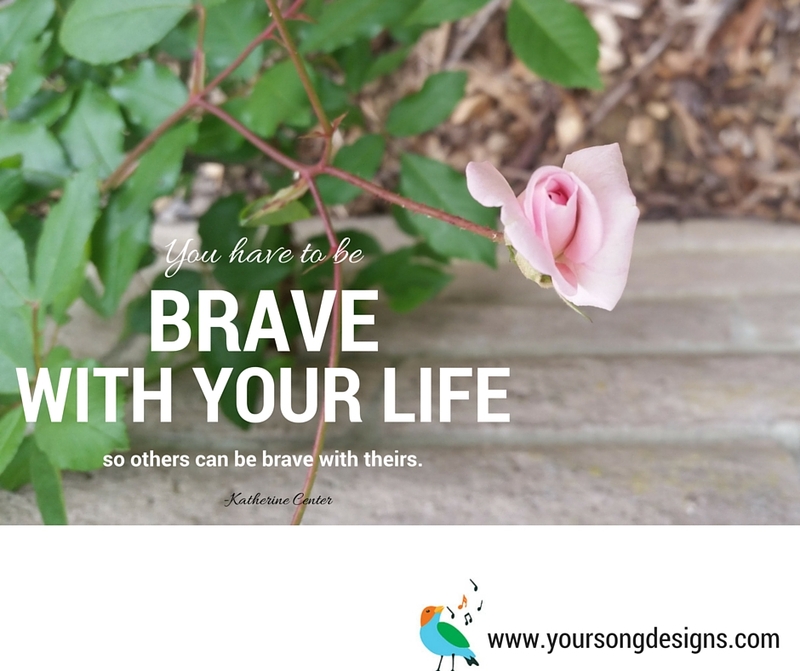 Writer Katherine Center captured this sentiment perfectly, saying: "You have to be brave with your life so others can be brave with theirs." Julie Haydon is an artist and musician living the beautiful hills of Oakland, CA who creates uplifting work that brings people together. When she is not at work in the studio or making music, she is outside playing in the dirt or hiking with her husband and their two spoiled dogs.